﻿ Pumula Lodge Knysna. JIMAT di Agoda.com! Ada soalan mengenai Pumula Lodge? Ketika melawat Knysna, anda akan merasa seperti di rumah di Pumula Lodge, yang menawarkan penginapan berkualiti dan perkhidmatan hebat. Dengan lokasi hanya 5 Km dari pusat bandar dan 75 Km dari lapangan terbang, hotel 3-bintang ini menarik banyak pelancong pada setiap tahun. Bagi anda yang ingin pergi agak jauh, Padang Golf Knysna, Kawasan Tasik Nasional Knysna, Hospital Swasta Life Knysna merupakan beberapa daya tarikan untuk pelawat. Kemudahan dan perkhidmatan yang disediakan oleh Pumula Lodge memastikan penginapan yang menyenangkan bagi para tetamu. Wi-Fi percuma semua bilik, simpanan bagasi, Wi-Fi di tempat awam, tempat letak kereta, bilik keluarga merupakan beberapa kemudahan yang membezakan Pumula Lodge daripada hotel-hotel lain di bandar. Suasana Pumula Lodge terpancar di dalam setiap bilik tetamu. televisyen skrin rata, bilik larangan merokok, pemanas, beranda/teres, kipas hanyalah sebahagian daripada kemudahan yang boleh didapati di hotel tersebut. Kemudahan rekreasi hotel, yang termasuk seperti padang golf (dalam jarak 3 km) , kolam renang terbuka, taman direka untuk anda melarikan diri dari masalah dan bersantai. Nikmati perkhidmatan yang sukar ditandingi dan lokasi benar-benar berprestij di Pumula Lodge. A little way out if Knysna, near the golf club but once inside you can appreciate the thought and care that has gone to make this a lovely location. Super infinity pool in the tranquil garden. Excellent room and facilities. Wonderful hotel!!! Very clean, peaceful, cozy, with a farm atmosphere!!! The was very friendly and helpful, really feels lake at home!!! You will find everything you need in the hotel and in you room. Also thanks a lot to the owner ( unfortunately don’t remember the name of this woman) and servers at the breakfast Agnezhka. 100 % recommended!!! We stopped in Pumula Lodge for 2 night to tour the area. The owner was very helpful and informative about what to do in the area. The B&B is the best one we had on our trip in South Africa and closest to a good hotel room. The breakfast was very good. We really enjoyed our stay in this Lodge. Worthy of their 4 star grading. This is the most lovely place to stay - excellent accommodation, fabulous breakfasts overlooking the beautiful garden surrounds. 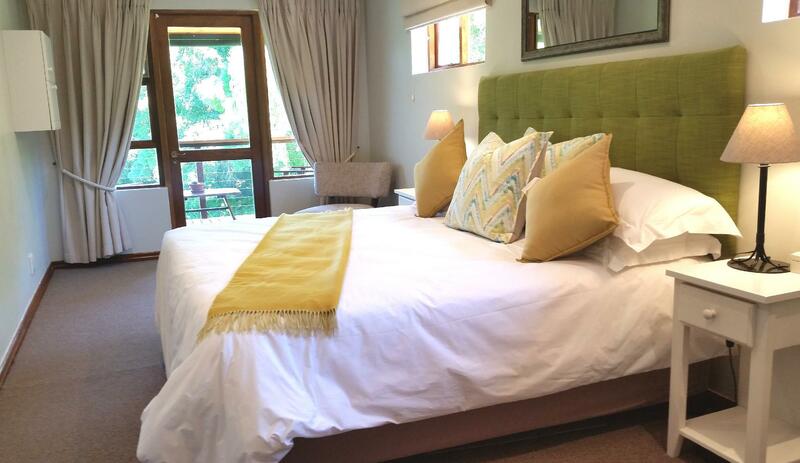 Nicely situated away from the hustle and bustle of Knysna Town. Rensia & her husband Pieter are wonderful hosts - well recommended. What a winner of a stay! Pumula Lodge is not in the center of town, but in a pleasant residential neighborhood about five minutes towards the Eastern Head. The management is top-notch, and a stay at the property is seamless. Check-in is smooth, rooms have all necessary amenities, tour information is readily available, and the breakfast is delicious. The biggest selling point for the property is the rooms' balconies, which overlook a garden teeming with wild birdlife. It's a wonderful place to wake up early, have a cup of coffee, and feel refreshed you're not in the city. On the negative side: because the property has five small rooms, they are only big enough for single or double beds. It can be a bit restrictive for a couple to have to share a double bed. The hotel is rated three stars, and that's likely because of the room size. For service and management organization, you're definitely receiving four star service at a bargain price. The cleanliness and the attention to detail in the rooms as well as dining and lounge area. The caring nature of the staff and especially Rentia. I felt safe and very much at home. As my husband was in a nearby hospital I was travelling alone and felt very comfortable with arriving on my own at night and with the safety of the accommodation facility. Die Lodge war sehr schön eingerichtet. Es hat an nichts gefehlt. Die Besitzerin war sehr freundlich und hilfsbereit. Das Frühstück wurde nach Wunsch frisch zubereitet. Wir waren 3 Nächte hier. Das Frühstück war super, das Zimmer zwar etwas klein, aber da man eh den ganzen Tag unterwegs ist, macht das nichts. Balkon mit Blick auf den schönen Garten mit Pool. Die Gastgeber sind total nett und zuvorkommend. Wir hatten nur ein französisches Bett in unserem Zimmer, welches uns nicht so gut schlafen ließ und durften dann in ein anderes Zimmer mit King-Size Bett umziehen, was uns sehr gefreut hat. Die positive Nachricht für diejenigen, die noch buchen wollen: Die Zimmer werden demnächst vergrößert und modernisiert! Der Aufenthalt in der Pumulalode war sehr schön und die Inhaber sind sehr freundlich und Hilfsbereit. Das Anwesen ist sehr idyllisch und sehr für Naturfreunde zu empfehlen. Erholung ist sicher.